​From prehistoric times the site at Belwood is said to of been used and occupied by Druids. The oak trees in the area being used for pagan festivals and practices. The Domesday survey of 1086 mentions a John de Belwood as one of the people swearing an oath to a Commissioner of William the Conqueror as to the assessment of lands at "Beltone". In 1144, in the reign of King Stephen, Roger de Mowbray gave a "cow pasture at Belwode" (Belwood) to the Knight Templars, of Balsall, Warwickshire. 1327 saw King Edward III give the Templars permission to build and run a Monastic Institution, this becomingTemple Belwood. The Templars were lawyers and because they taught law and politics to the young monks rather than religious study the Temple was taken from them in around 1500. It was given to their rivals the Knight Hospitalers who taught religion and medicine. The Hospitalers built a chapel 500 yards to the east of the Templein about 1530. 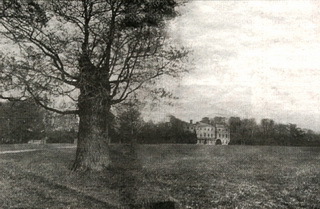 After the dissolution of the monasteries in 1536 the Temple and the lands at Belwood were given to Henry Vavasour in right of his marriage to Isobel Brownlow. After his death it remained in the family for four generations eventually being owned by Thomas Vavasour. Thomas Vavasour had the title "The Solicitor" because he had petitioned King Charles I to stop Cornelius Vermuyden from draining Hatfield Chase, a very large area that included the Isle of Axholme. In 1627 Vermuyden had asked the King if he could drain the vast expanse of Hatfield Chase, it was this huge cost of trying to stop the drainage work that financially ruined Vavasour. 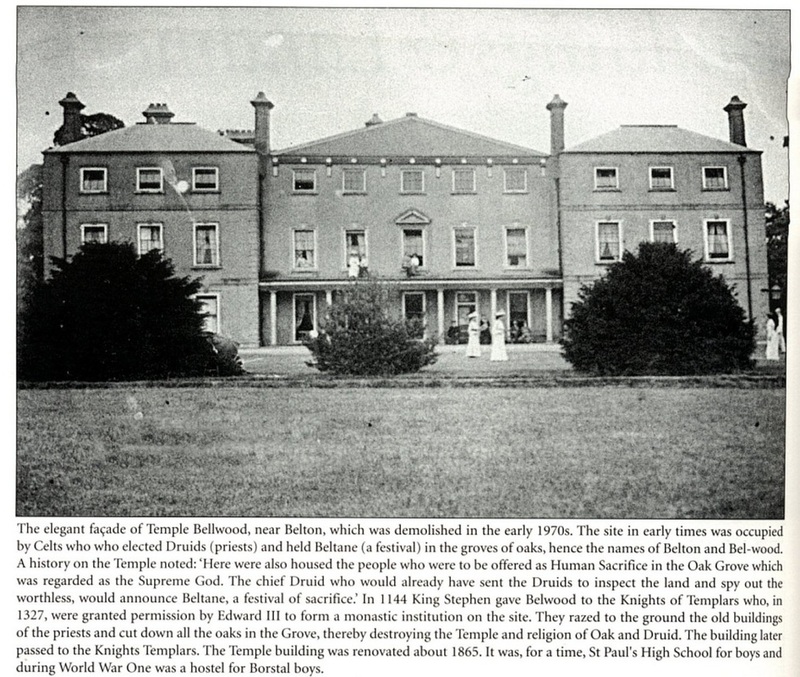 After buying Temple Belwood, Thomas Wilkinson, and the trustees after his death in 1908, rented the house out to many different people. 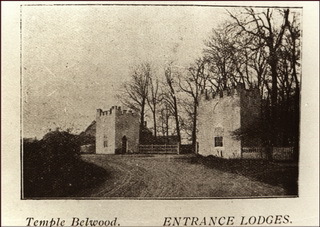 From about 1900 a boarding establishment had been opened at Temple Belwood by Mr. Timothy Kynnaird, Newburgh, Radcliff. Through lack of trade a brochure was published in around 1905 to advertise its grandeur and splendour, but this did not bring in enough guests to make the venture viable. In December 1906 with mounting debt a meeting was held in Sheffield at the official receiver's office to discus the affairs of Mr. Radcliff. Debts owed to unsecured creditors stood at £1,678 19s 7d, for rent and taxes £67 10s 7d and for wages £23 18s. As assets were only at £229 5s, Radcliff was in debt to the sum of £1,471 3s 2d and Mr. A. H. Brock of Doncaster was appointed at the meeting as trustee to wind up Radcliff's business. By 1909 Mr. Thomas Johnson, no relative to the previous owners, ran a "High Class Boarding Establishment" and by 1913 it was a boarding house run by a Mrs. Eliza Southern. The house was bought by Robert Ryther who's descendant John Ryther died leaving it to his daughter Catherine and her husband Richard Popplewell. It then past on their deaths to their son Richard and in 1752, to his daughters, one of which was married to Robert Steer, the other Katherine, was married to Alan Johnson. 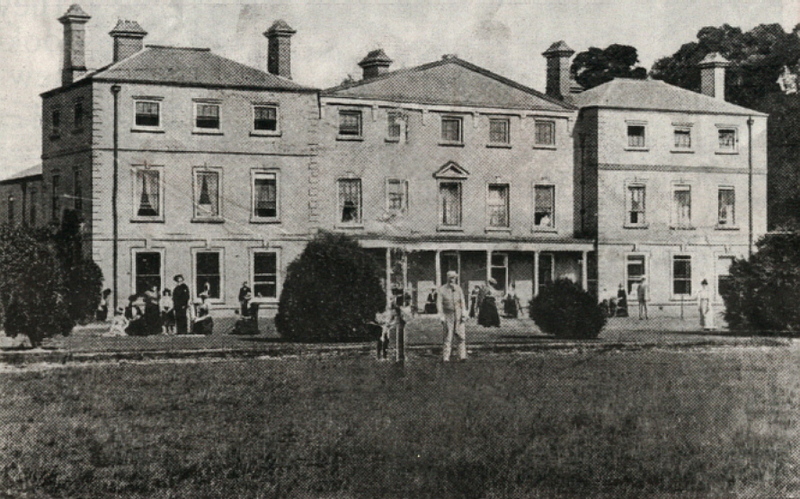 After the death of Alan Johnson Temple Belwood was rebuilt and extended with east and west wings and a new north front being added by his son, William Johnson, in 1787. A 30 feet high obelisk was built in the park as a memorial to the Squires favourite horse, Sir Solomon, who broke a leg while hunting. So aggrieved was the Squire he shot his best two hounds and buried them either side of the horse. Through local knowledge the burial site is not at the obelisk, as some believe, but in the Dog and Horse Plantation to the north east of the house. 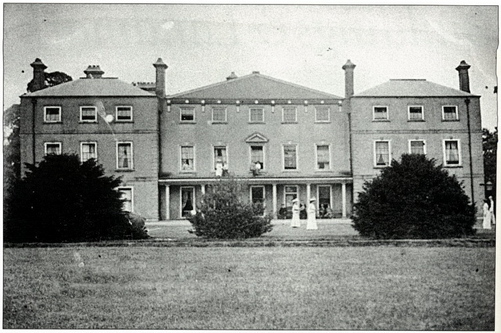 During the Great War (1914/18) the house became a hostel for borstal boys who were used to work the land on the farms. It was after the war when most of the estate was sold off to its tenant farmers with the house being sold along with a small piece of land to a group of London speculators called Hooley’s Syndicate. This land deal fell through when Terah Hooley, head of the syndicate, was put in prison. After this the trustees rented the house to Mr. & Mrs. McNamee who opened St. Paul's College a boarding and day school for boys. The college was a success but after her husbands death Mrs. McNamee gave it up in 1925. In 1932 after damage was caused to the house, a caretaker was appointed and a fee of 3d was charged to all visitors. 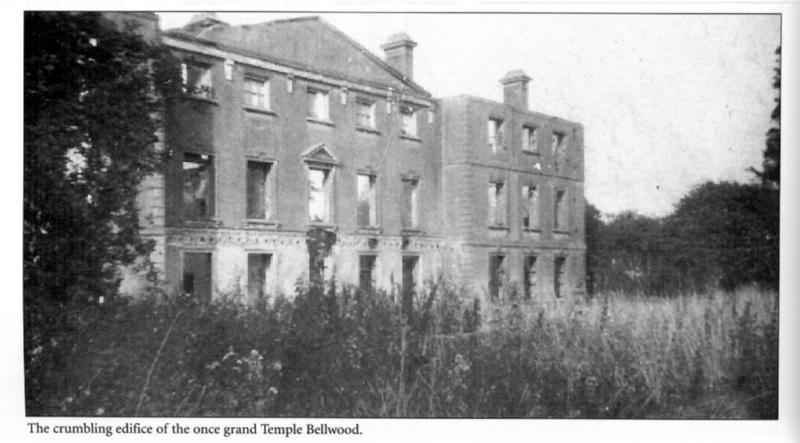 The caretaker, Mr. J. G. Rees wrote and published a booklet in 1933 called "Temple Belwood - It's Past and Present". Between then and World War II the lead from the roofs was taken and over the next few years the house fell into ruins. 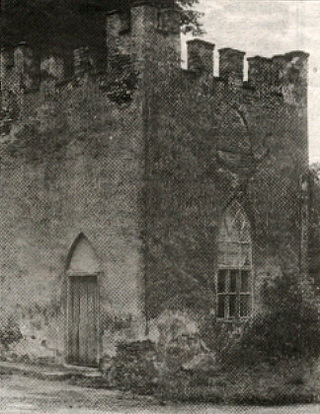 The two castellated gatehouses were demolished in the 1960‘s but the walled garden is still there. 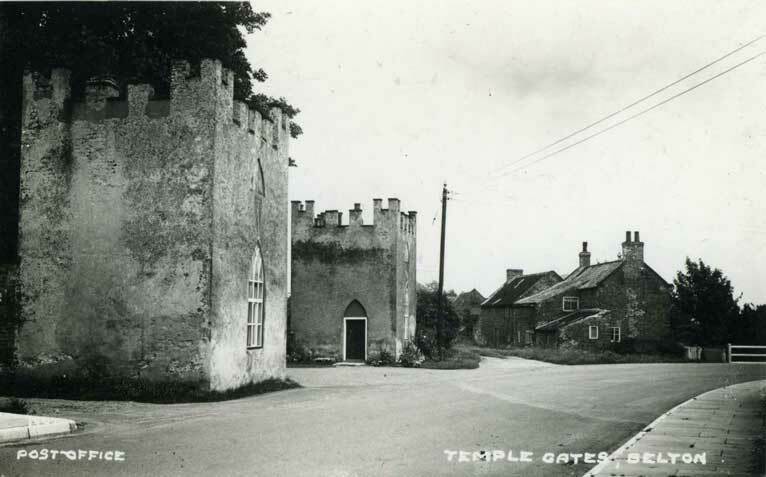 Temple Belwood finally disappeared under the new M180 motorway in the late 1970‘s along with the ruins of the Belwood farmhouse, a building, that had been used in the twelfth century as a farmhouse, had been converted into a chapel in 1530 by the Knights Hospitalers and then reverted back to a farmhouse after the dissolution. A carved stone Maltese cross from the old building was saved and was built in to a wall at Belton Primary School, also two sections of stone pillar from Temple Belwood were salvaged by Belton Parish Council and erected in the churchyard.